24 hours a day, month after month, year after year, pulp, paper and cellulose mills are subject to the effects of corrosive and erosive fluids under extremes of temperature and pressure. Vibration, crystallisation, scaling, and the presence of impurities such as sand or metal in the mixture are all conditions under which the plant’s control valves must operate – and operate reliably. 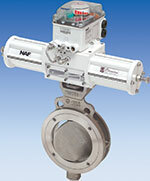 Valve & Automation’s selection of NAF process valves have been designed to cope with and exceed even the harshest demands of such severe industry applications. However, to ensure long life and trouble-free operation, it is essential that all valves are chosen carefully to suit the application where they will be installed. With a history of 30 years’ experience in the pulp and cellulose industry, Valve & Automation, together with long-standing partner NAF in Sweden, are well placed to guide plant owners through every step of this crucial selection process. The company’s managing director, Ron Nel, explains that over the years the team has acquired industry-related experience from valve selection according to application, through commissioning, to frame agreements for deliveries staggered over the duration of a project. With over 25 000 valves already supplied to local producers Sappi & Mondi, Valve & Automation offers a service to control the issuing of valves during a project through managing its customer’s valves store, as done on the Sappi GoCell project where over 4 500 valves were supplied. Assisted by its principal NAF – with more than 100 years’ experience in pulp, paper and cellulose projects – the company is fully qualified to support end users with valve supply and technical advice from design stage through to commissioning, and will remain there to support maintenance staff when they take over. 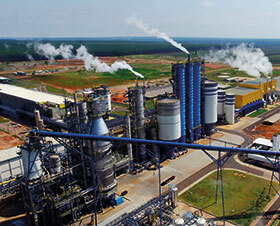 Eldorado Cellulose’s giant pulp mill located in Três Lagoas, Brazil, is designed to produce 1,5 million tons of product annually. Known as the first autonomous pulp mill, the facility incorporates smart sensors and other instruments to collect data. This is then communicated to the central control system, from where it is ‘mined’ by the plant’s ERP software to navigate a path to optimal production efficiency and profits. The net result of this automated, data-centric approach was an increase in the ‘as designed’ capacity of 1,5 million t/a to an ‘as producing’ capacity of 1,7 million t/a – an improvement that adds millions of Brazilian Reals to the bottom line every year (1 Real = R3.75). The Eldorado Cellulose facility in Três Lagoas marries efficiency, achieved through shrewd deployment of state-of-the-art technology, and sustainability, achieved through raw materials fed from its nearby eucalyptus forests – a 100% renewable source. After the trees have been debarked and cut into chips, the next production step involves cooking the wood in chemicals. The mixture is heated under pressure to 130-170°C and held at that temperature for a period of time. The combination of heat and chemicals dissolves the lignin and separates the wood into cellulose fibres. Then the pressure and temperature are lowered and the pulp is blown or washed out of the digester. The washing process is designed to separate the spent cooking liquid containing chemicals and dissolved wood substances – black liquor – from the pulp fibres as efficiently as possible, and with minimum of dilution of the liquor. It takes place in the high heat washing zone of the digester and involves various equipment such as filters, diffusers, belt washers and presses. The recovered black liquor can then be burned to produce energy that is fed back into the process. The screening system is designed to remove uncooked chips, large knots, fibre bundles, sand and stones. The screening system ‘rejects’ are fed to a secondary screen, while the ‘accepts’ are recirculated. The knots from the secondary screen are then sent back to the digester for another round of cooking. Due to their dynamic nature, the processes described depend on the reliable operation of control and shut-off valves to achieve maximum efficiency. Control of the fluid flows in the Eldorado mill is achieved through the €13 million investment in a total of 1584 NAF control valves of the Duball, Setball and Torex ranges. Final selection was made after extensive collaboration between NAF experts and plant designers to ensure every choice in this trailblazing project was rigorously considered and understood. 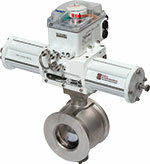 The NAF-Duball DL is the latest addition to the range of high-performance rotary control valves. It is a full-bore ball valve, targeting the need for automated ball valves in harsh processes such as those in the pulp, paper, cellulose as well as chemical industries. The excellent characteristics with a wide range of materials are particularly beneficial under tough operating conditions where difficult media and extreme pressures stress the design, materials and performance – 553 were supplied for the mega project. This ball sector valve with metal-to-metal seating combines the best control features of the ball and butterfly valve. It can be used both as a control and as a shut-off valve, and has an enlarged outlet with one size bigger flange to achieve optimal flow characteristics in pulp and slurry applications. The NAF Setball SF is ideal for any application involving particles, fibres or slurries. The high flow capability in combination with its compact size makes it a viable and economic alternative to linear control valves – 665 were supplied for the project. in a variety of materials including carbon, steel, titanium and stainless steel. The rugged design and excellent characteristics are particularly beneficial in control applications involving difficult media and demanding pressure conditions – 366 were supplied for the project. The massive scale of the Eldorado Cellulose project ($2,5 billion) made the plant owners dependent on the multitude of vendors for more than just the supply of equipment. Given the size of the plant and the diversity of the processes it became essential that suppliers contributed in a technical capacity as well. Considering the valves alone, and given the variety available in the market, it became imperative that the industry experts at NAF moulded themselves into the design team. Nel confirms that the choices available today often make it difficult for designers to identify the option that best fits their unique situation. The implication is that in order to add maximum value, vendors have a responsibility to support their customers through all phases of a project’s lifecycle – from plant design to equipment disposal. Eldorado Cellulose’s autonomous mill mega project serves as an example of the value that can be achieved when state-of-the-art technology and an environmentally conscious attitude are combined. Good design decisions and intelligent use of automation provide the platform, but the support of suppliers with the urgency to understand that technology on its own is no longer enough to provide the glue that welds everything together. 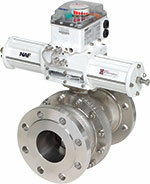 When it comes to flow control solutions in pulp and paper applications, valve expert NAF is just such a supplier. Smaller industry-related projects could benefit from the formula as well.